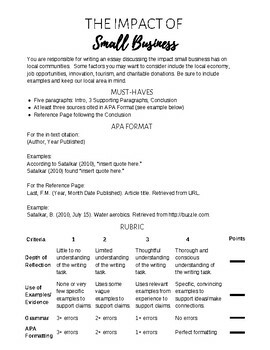 This essay prompt and rubric will help your students practice their research and writing skills while reflecting on the business topics you cover in class. It also includes a sample of APA formatting to help students practice citing sources and creating reference pages. I usually give students 3-4 days to research and complete the assignment. This project could easily be incorporated into any business course.